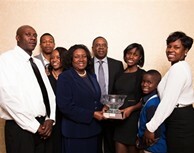 On January 26, 2013, the Spigners of New York, NY were honored by USTA Eastern as the Tennis Family of the Year. The Spigners were among 38 individuals and organizations that were recognized at the section’s annual awards Luncheon and Dinner at the Renaissance Westchester Hotel in White Plains. Shortly after Robert Spigner got married in 1968, he took a break from playing basketball with his friends and visited his wife Geri’s tennis class at Brooklyn College. The instructor let Robert play, and before long, he was playing tennis with Geri every Saturday and Sunday throughout Brooklyn and Queens. "Tennis was something we could both play," said Spigner. "It brought my wife and I closer together." As the years went on, the Spigners passed their love for the game onto their children, Simone, Brian, and Danielle, teaching them how to play and taking them to USTA Eastern junior tournaments. Each of the kids went on to play college tennis and receive scholarships – Simone at South Carolina State University, Brian at Morgan State University, and Danielle at Fordham University. Simone and Brian continue their love for the sport today as teaching pros: Simone at the Harlem Junior Tennis and Education Program (HJTEP) and Brian at New York Junior Tennis and Learning (NYJTL). And Danielle, who works in publicity for BET, met her husband Daniel Davis at HJTEP, where he currently works as a teaching pro. "Tennis has been a huge blessing for our family," said Simone Spigner, whose children, Shayna Spooner and Donovan "D.J." Spigner, are USTA Eastern junior players. "It’s helped pay for our education, find careers that we love, and been a great way for all of us to spend time together." The tennis tradition continues in the family. Shayna played on the Eastern BG 16 Zonal team that won first place in Winston-Salem, NC last year. D.J., who has demonstrated 10 and Under Tennis for First Lady Michelle Obama, tennis legend Stefanie Graf, and top-ranked American player Sloane Stephens, is now competing in USTA Eastern tournaments, being driven by his grandparents, Geri and Robert. "It’s been a great experience," said Robert Spigner, who teaches tennis for NYJTL. "You meet so many nice people throughout this journey."